Home Decoration is an art. You can decorate your home in many ways with various appealing techniques. 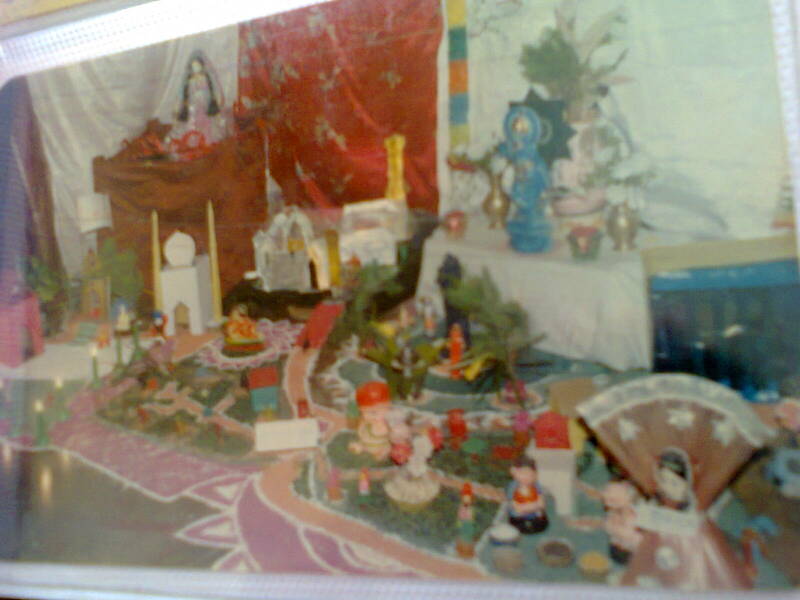 Decorating with furniture, decorating with lights, with wall hangings, sceneries, dolls, or decorating with any artwork or designs on walls and, with rangoli on floors. Each one of these is a superb idea for decorating your home and making it a beautiful and appealing place to live. If you own a spacious flat or home with much spare space in your drawing room or hall, you can allocate a corner of it for creating some very beautiful scenery with a combination of wall hangings, paintings, rangoli designs, and dolls. Decorating the floors of your home with colorful rangoli designs is one best method of making your rooms beautiful as well as hygienic and eco-friendly. Rangoli is the art of drawing or making designs and patterns using the rangoli powder, or chalk, or paints on the floors. You can use the floor space inside your living rooms, hall, pooja-room, or at the entrances to the home. It can be done at the front side main entrance of the house, at the back door entrance of the house and also in your alleys and courtyards; thereby turning the entire atmosphere into an awesome place of art and culture. 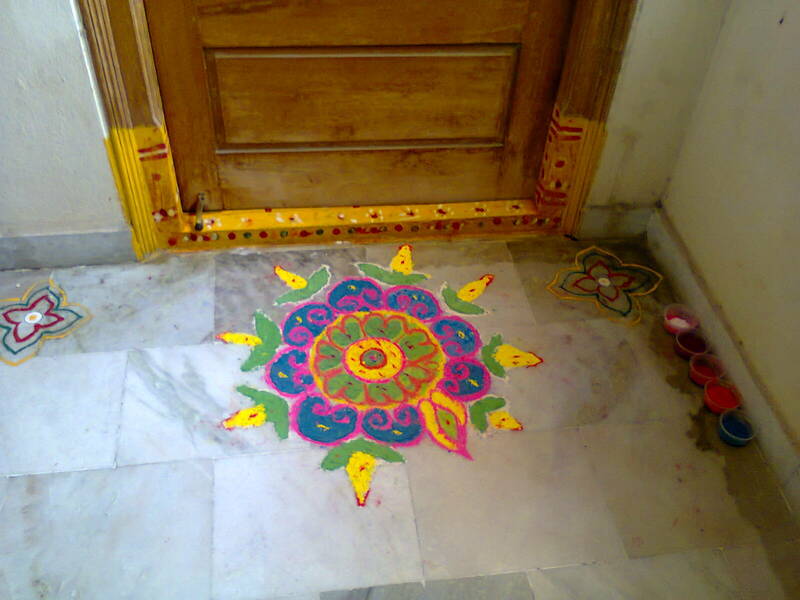 Rangoli is a great tool for Home Decoration. Rangoli ensures keeping your home and environment neat and clean as well as hygienic. Further, it boosts your spirit and talents by engaging you in a daily touch of art and drawings. Rangoli is a Hindi word. It is also known as "Kolam" in Tamil language and "Muggu" in Telugu language. Rangoli powder is made up of either rice flour or chalks powder or white stone powder or a mixture of all these items and which can be also mixed with other synthetic color-powders and petals of flowers. It is widely available in all markets in India and at some of the other southeast Asian countries. It can be prepared at home also by mixing the above-mentioned items. There are many ways of drawing the patterns and designs. These designs and patterns get erased and new ones prepared daily on a temporary basis. 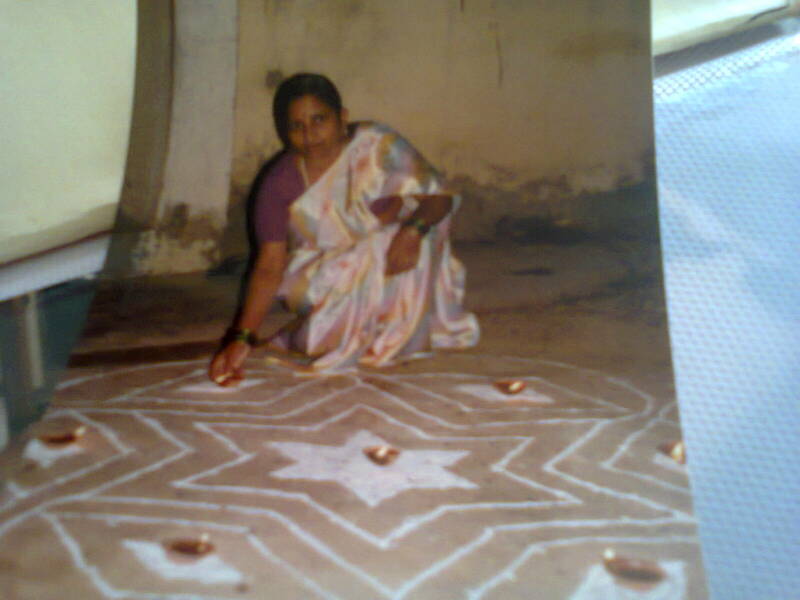 Make dots of any design and link the dots with white rangoli powder. For example, you can make round shapes, squares, stars, leaves, corn shapes or any pattern and designed shapes as per your imagination and skills. Or, if you are good at drawing and art, you can straight away draw the designs and patterns with the rangoli powder or thick wet chalk. You can fill some of the portions of the design with rangoli powder and flower petals also to make it more appealing and visible as shown in the right-side first image. You can make colorful designs also using colored powders and chalks and colorful flower petals as shown in the other image in front of the door which also gets erased and a new one is prepared daily. These designs can be made outside your door entrances or alleys and backyards also on daily basis. Draw and make designs with paints on the lines or patterns and designs instead of spreading or filling with your rangoli powder to make them permanent for many months You can make any pattern or design of flowers, leaves, vines and of paddy/wheat/cereal corns, etc or whatever design you may like. Use different colors of paints with beautiful combinations for each part of the designs showing your skills. These designs can be made in all four corners of the room with a large design in the center of the room as shown in the images below. The left side image is meant for the four corners of the room and the right side image is for the center of the room. Make matching designs when decorating all four corners and the center of the room. You may also like to draw lines or chain-like designs joining the four corners alongside the wall border to make it a complete whole floor design. These designs will not erase for many months and even years unless you erase them. You can clean the floors with a damp cloth without hampering the designs.